We are transitioning to html5 support and we are having problems with mp4 playback. We have reencoded our flv files to mp4 using ffmpeg. The files play correctly on a local machine, but when played from Wowza the buffering events seem odd. The "buffered" bar will sometimes not go all the way to the end of the video playback bar (i.e the bar is half full and it never fills to the end). We can however seek past to that bar, so we know that the content IS being buffered. Seems more like buffering information is not correctly displayed. In safari, we also see "Live Broadcast" on the controls even though this is VOD. What do you mean, "transitioning to html5"? 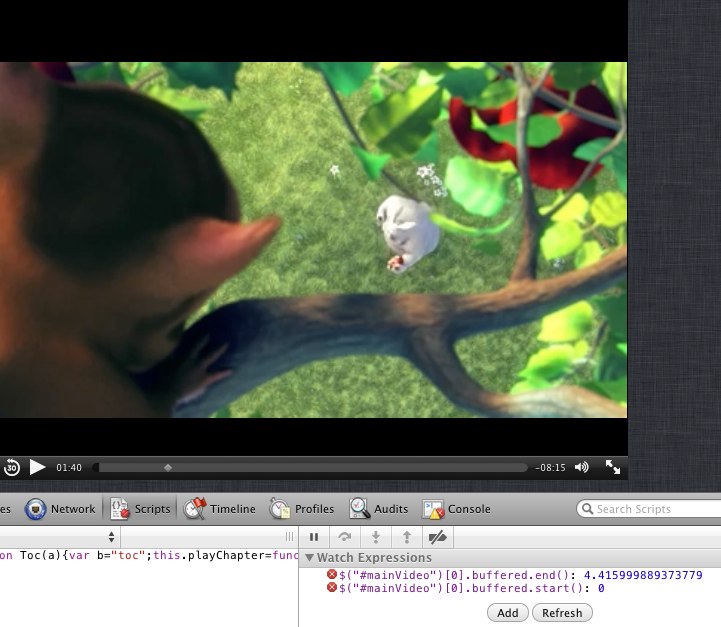 HTML5 video tag is only useful in Wowza with Cupertino streams to iOS devices or Safari on Mac OSX. I'm not sure how or if you can alter "Live Broadcast" label. I meant the process of encoding our videos to mp4, and creating an html5 player to be used when the user is using Safari or iOS. The problem happens in both these platforms, but it looks worse under Mac OS. (can barely seek using the controls, and the html5 methods buffered.end() and buffered.start() always return wrong results. Compare playback with the Wowza sample.mp4 file. You can see how buffered.end() displays 4.4 seconds.. and that is after 2 minutes of the video being played. This information remains the same throughout the whole playback (i.e the buffering bar does not move at all). Also , we are playing way past that point so that would not be possible. Even more curiously, when refreshing the video src, the buffered.end() and buffered.start() methods return the following at all times. Our videos have a keyframe interval of 2-5 seconds, but I honestly don't think this is what's causing the problem since it happens as well with the sample video.